It’s always tough when friends ask you to review something. Clearly they’ve put their heart & soul into the material and they want feedback; gentle, but feedback nonetheless. They turn to their circle, hoping that if they made an out & out turd, at least their friends will let them down easily. Luckily for me, I don’t have to let Eastin and Ryan down easily, as “Howl” #1 stands on its own two lycanthropic feet as something worth investigating further (and investing in right now via Kickstarter). Howl #1 tells the story Jack Lowe, who is apparently the last man on Earth; welllll, the last man man. The last homo sapien. For some unknown reason, Jack is the last non-werewolf on the planet. The 5 W’s of Journalism kick in almost immediately as I was reading issue #1 and wanted to immediately reach out to the creators & press them for answers. Honestly though, I’m anxiously awaiting the next issue, hoping that it brings a few answers before additional questions start arriving. 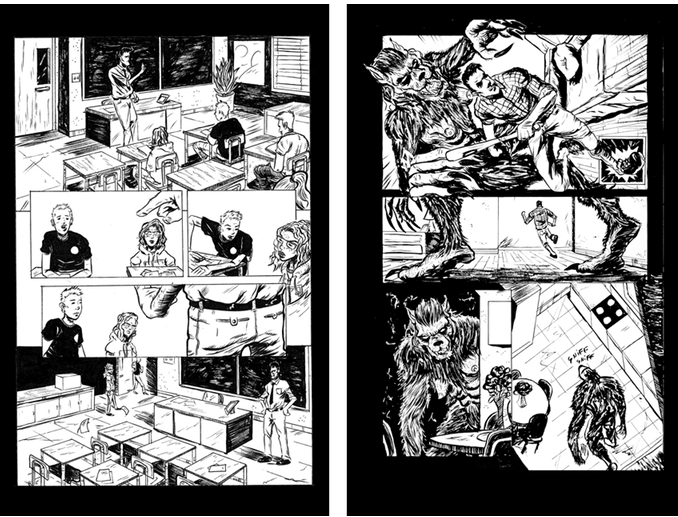 As for the story, don’t worry, this isn’t another post-apocalyptic world of grey misery you have to trudge through; our dude’s a history teacher at a school full of normal-seeming teenagers (who are monsters to begin with, lycanthropy or no). He’s got an interesting marriage and a blowhard for a neighbor. I’m hoping their Kickstarter blows past its goal so that we’ll get a nice long look at the world of Howl; werewolves as bad motherfuckers who are bipedal creatures of destruction, goddammit, not shirtless male models who mope around before being pressed into service out of some weird fetish for pasty teenage depressives. Fun fact: Did you know that this is the same creative team that Modern Borefare once interviewed about the killer webcomic, Spaceship Long Island? It’s true! Believe it or don’t. Click here to back them on Kickstarter! Thanks man! This is generous and much appreciated it! Hope you don’t mind if we blurb it (with a link obvi) on the KS page!